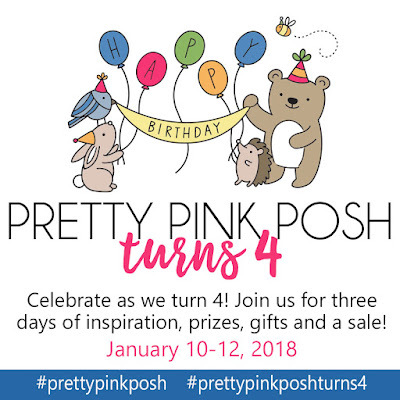 Hi friends, today I'm participating in Pretty Pink Posh's 4th Birthday Celebration! I'm so excited to be here today joining in with a ton of other designers for a three day blog hop! I hope you enjoy all of the inspiration! 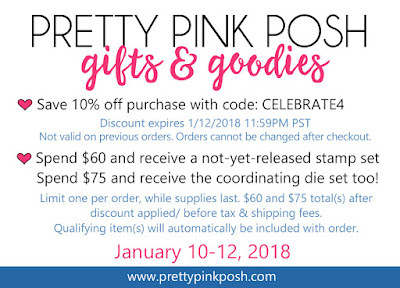 There is quite a lot of information for this blog hop along with deals and specials going on so make sure you read below to be entered into the giveaways and to find out all the information! 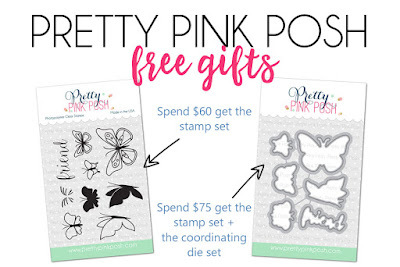 There are some super cool discounts going on above so make sure you check out that and below is the stamp set with qualifying purchases. Now all the discounts, deals and giveaways are addressed, let's move on to participants for today's part of the blog hop! Remember too check back for the next two days as there will be more inspiration! Now that all of the details are out of the way, let's move on to my project. 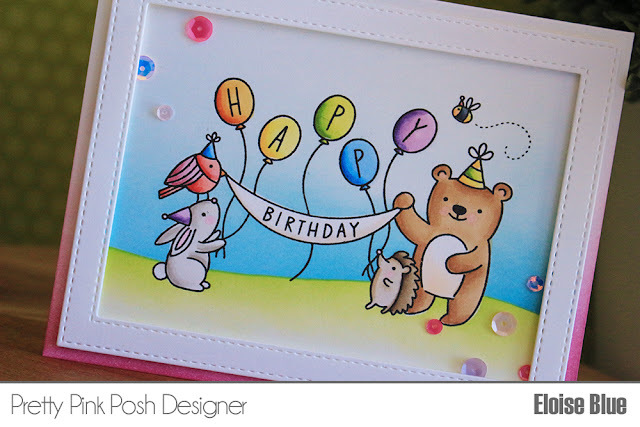 I used the Birthday Scene stamp set along with the new Spring Blooms Mix to create my card today. To begin my card today, I cut down a piece of white cardstock and stamped down the large image from Birthday Scene with my MISTI stamping tool, since I didn't have a block large enough. Once I stamped it down, I also stamped it down onto a piece of Inkadinkado Masking Paper. I used my fine detail cutting scissors, cut out all the pieces of the masks and laid them over the stamped image. I then took some more masking paper, cut a hill shape and adhered it over the bottom half of the image. I then took some Tumbled Glass and Salty Ocean Distress Inks and ink blended the sky, fading it up to white. I then used the negative part of the mask, placed it over the already inked sky and ink blended some Mowed Lawn and Twisted Citron ink for the grass, again, fading it out to white. Next, it's the exciting part. I get to peel up all the masks. So once I removed the masks, it reveals the clean image that is all one layer, with a nice coloured background - super fun! So, I then coloured all my images with Copic Markers making it as rainbow as possible. Once the images were coloured, I used two rectangle dies to create a frame. I then adhered the frame around my scene with foam tape. To finish up my card, I scored a card base to create a top folding landscape card and ink blended some Picked Raspberry and Spun Sugar onto the card base directly. I did this to mimic the sky/grass blending and also to give an additional pop of colour. Lastly, I adhered some Spring Blooms Sequin Mix around my scene. Thank you so much for stopping by today, the video is linked down below in case you would rather watch than read! Be sure to comment below to be entered into the giveaways and check out the deals above. The next person on the hop is the amazing Jeanne Jachna! Love the vibrant colours you used, Eloise. Thank you for sharing. Beautifully colored and a very super cute card!! What an adorable card! Your ink-blending and coloring are perfect! Such an adorable card, Eloise, thanks for sharing! What an adorable release! I love your card so much (always do!!) and this stamp set is amazing - so fun!! Now to watch the video! This stamp is awesome, and you did a great job with the masking. Happy new year. Sweet little birthday card! Love this release. What an adorable birthday card! I love the way you colored the cute little critters. Adorable! I need to get out of my comfort zone and start using a masking technique! Love this card, thanks for sharing the video! Adorable! !This stamp in on my shopping list. That is such a cute stamp! Love your adorable card and great video. Thanks Eloise! So sweet and made me smile this morning! What an adorable B Day card! Cute, cute, cute! Hi. Happy New Year!! I love your card, it's beautiful! The Birthday scene is the cutest image ever!! The size is perfect! Such a cute card and the images are so sweet! I love this cute and colorful birthday party! It is so bright and cheerful and looks amazing! This card is so very cute. I would frame it!! Adorable, I love how we can all get excited when we remove the masks and see the card come to life. Thanks for sharing. Adorable Birthday scene! Love those critters! Such a cute card!!! The happy critters just make me smile! 😁 thanks for sharing! Beautiful ink blending! Love the cards. Your birthday card is super Adorable! Love it!! 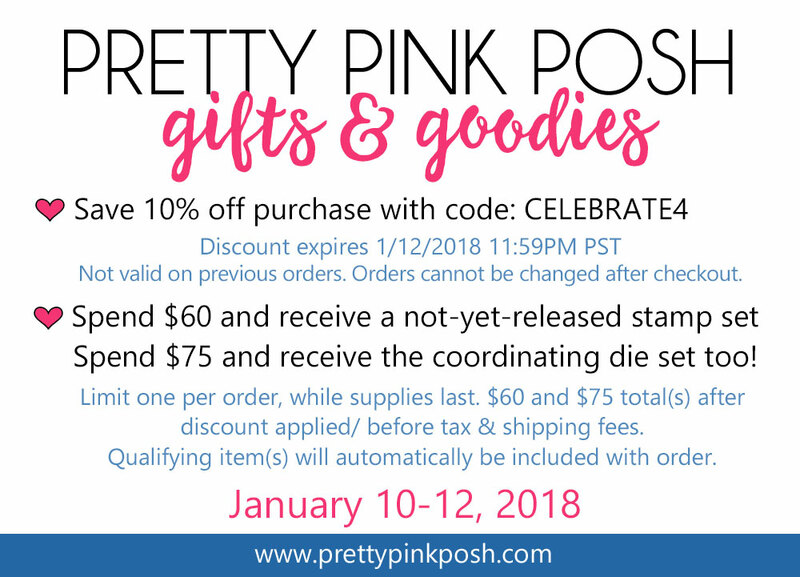 I love pretty pink posh stamps and dies. So cute and fun! I love this birthday set. Love this card! This is my favorite stamp in the release! This is SO adorable! I love it and your coloring is gorgeous! Adorable card! What a fun release. Love your sweet card Eloise! I love your style! Thanks for sharing! This is so cute Eloise! I love your coloring - all that masking would have made me crazy!! Looks amazing though and worth the effort! Very cute card, the critters are adorable! Ella, your card oak so cute, bright and cheerful! What a fun stamp! Such a fun card, so cute! love the happy birthday stamp set! Your card is adorable, and I really enjoyed watching your video! Your card is adorable ! 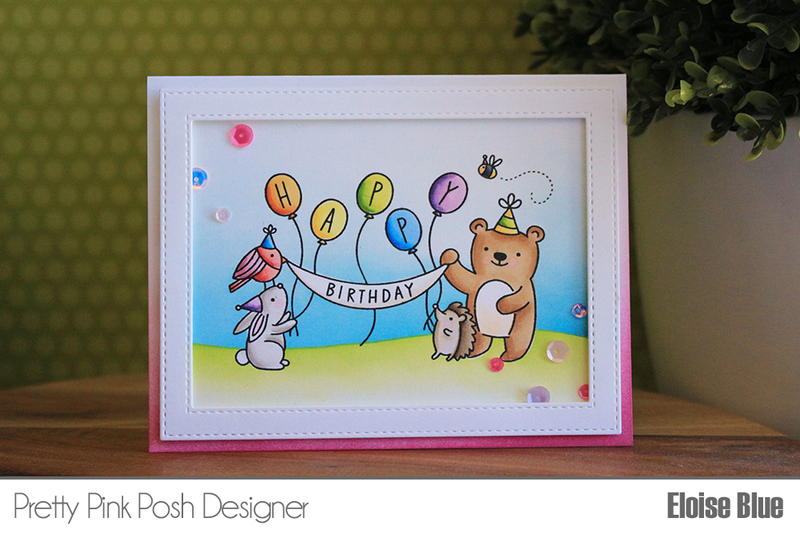 I love the pink you've added to the card base with the blending to the white, it's an excellent idea. Such a gorgeous release, love your colouring. Very cute card, love the colours. The new stamp sets are so cute! This card is soooooooo cute!! Love the colors you used! Love your cards!!! Also thank you for doing a video also, I really enjoy watching it. 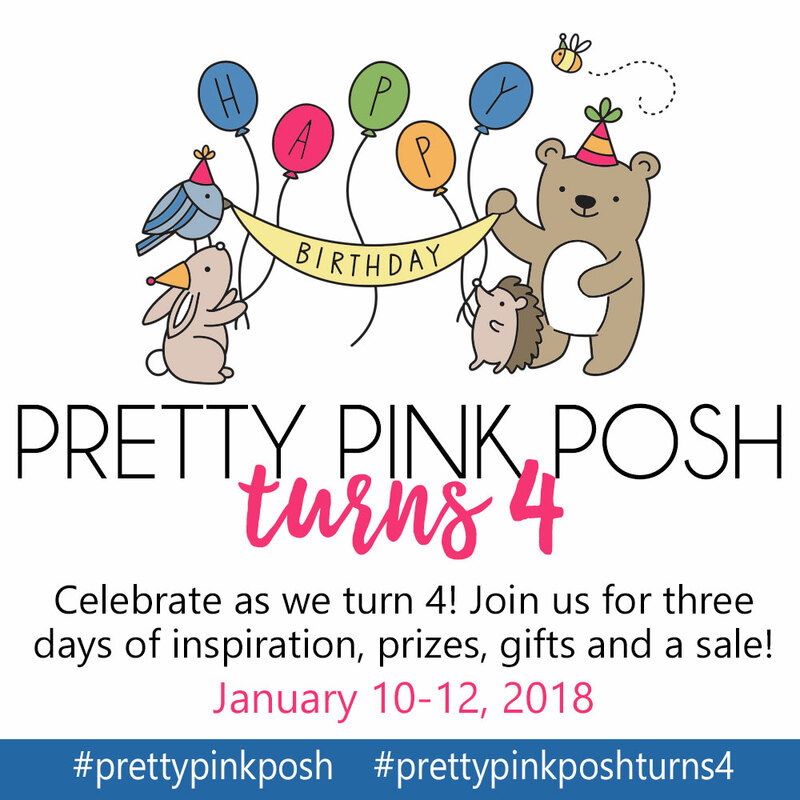 Happy Birthday to Pretty Pink Posh! Ella, your birthday scene is perfect and your coloring is so pretty! What a beautiful card! I love all the color blends! Absolutely adorable and beautiful coloring. Sweet birthday scene and great technique. I really love your Birthday card, super cute!!! What a cute card. The artwork is so fun on the stamp. Yes, super duper scene and card! Love your distress ink blending behind the scene and on the card base. I love doing masking when it turns out well! HA Very pretty card, love the color scheme too. I love how you use the distress ink blending as the background. I have just started doing this for my cards. Adorable card! This is an awesome release as always. Love everything about it!! Such a cute birthday card! Love the little hedgehog! Too cute! Very Cute Birthday Card! I'm loving this release! Oh Eloise, this is so super cute. My grandson will be 4 on Sunday and I STILL haven't made his card....IF I have something similar I will try this. What an adorable set and he new spring mix of sequins are really pretty. TFS! Beautiful card! thanks for listing all the copic marker colors, helps us newbies! Very cute card...love the images and the gorgeous colour. Aww, this card is so cute, Eloise!! Darling birthday card! Love your pretty coloring and the sweet critters! Happy 4th Birthday to PPP! These colors are gorgeous! Adorable card!!! Such a fun birthday scene! Love your card and as always your coloring is perfect. FANTASTIC CARDS! YOUR DESIGN AND COLORS ARE SO PRETTY !! Such an adorable card and stamp! This is such a sweet scene. 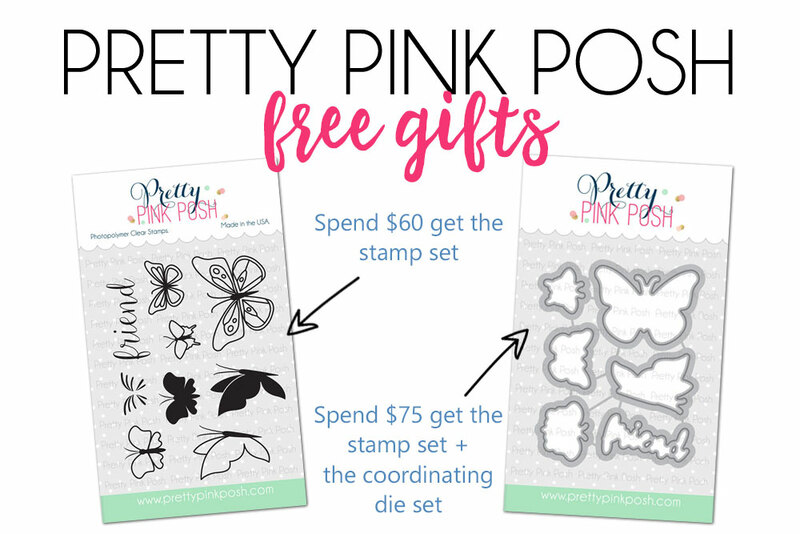 Another wonderful stamp set from PPP! what a great card, I love the background! What a great birthday card! It's so colorful and cute! I love that you finished it off with the frame and sequins for a little dimension. Such an adorable card! So bright and cheery! Sweet card and darling scene cute critters. adorable! I love the background and you did a great job blending it. Happy 4th Birthday to PPP. Ella, I'm smiling allllll over my face in seeing your sweet animals/rainbow card; perfect showcases of the new release! So appreciate the video; delightful to watch the magic unfold! Those little birthday animals steal the show... They are super cute! Such a cute card and I sooo appreciate having a video to watch. I become frustrated reading directions. This is such a fun scene! Thanks for sharing the technique video. Thanks for sharing and the opportunity! Absolutely adorable scene! Awesome card. Darling, cute scene and beautifully colored. You create the most adorable scenes! And I love your videos, too. What an adorable card! And great colouring. Thanks for sharing! A darling card! Thank you for sharing! Adorable. The frame highlights it perfectly. Love your fabulous, colorful card. The little critter stamps are adorable. That’s such a cute, festive card ! Such a cute little birthday scene! Such good coloring...you make it look easy!!! I love this card and this stamp is one of my favorites! Gorgeous blending and masking! I love how your card turned out!! A beautiful card! Love the coloring. Love the soft birthday card. Wish now that I got that stamp but maybe later. Thanks for your videos-love watching them. Oh my goodness, I just love your card! It's too cute! The stitched frame and your coloful background really makes this card an eye catcher! OHHH!!! Such a a cute and colorful card! The birthday scene stamp is so sweet! Love what you did with it! A lovely birthday card, beautiful colours. So very cute! I like your Copic coloring and I am glad that you shared the colors you used, as well as the process of coloring the scene. Thank you!